1. North (American River) Grove: Consists of 6 standing and 2 prostrate trees from 2 to 12 feet in diameter. No reproduction. In Placer County at 5,100 feet elevation, on a small tributary of the Middle Fork of the American River. Inaccessible. 2. 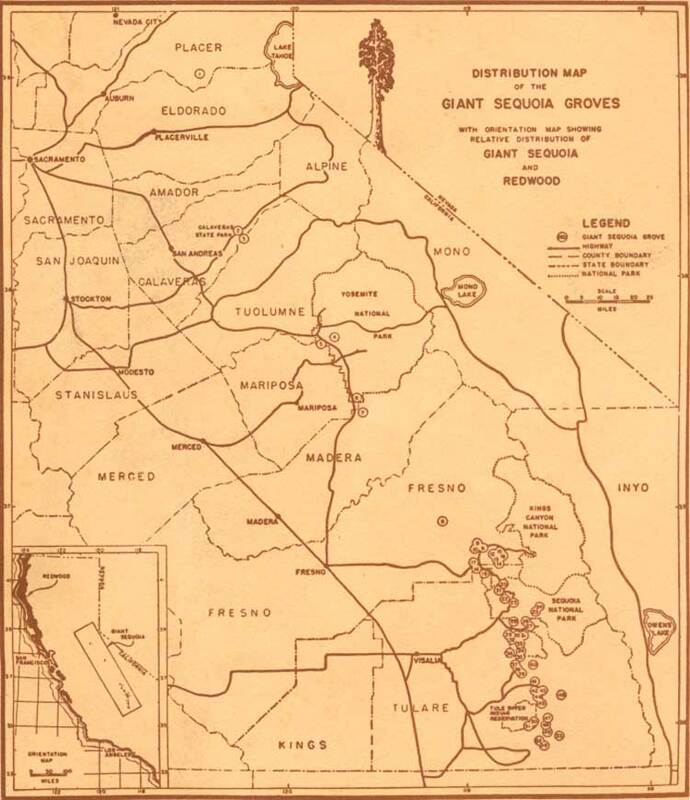 Calaveras Grove: About 50 acres of sequoias with more than 150 trees, of which at least 85 are 10 feet or more in diameter. One of the best known groves and the first to be publicized following its discovery in 1852. In Calaveras Big Trees State Park, 54 miles south of the North Grove, on a tributary of the North Fork of the Stanislaus River at 4,700 feet elevation. On a State highway. 3. Stanislaus Grove: A large, fine, privately owned grove of about 1,000 acres containing 947 trees, of which at least half are 10 feet or more in diameter. Includes one of the largest treesthe Agassiz Treewhich is 30 feet in diameter and 250 feet tall. Located 6 miles south of Calaveras Grove and on both sides of the North Fork of the Stanislaus River. Accessible only by trail. 4. Tuolumne Grove: A small grove of 25 fine specimens and also the Dead Giant, 29-1/2 feet in diameter. Covers about 20 acres. The first giant sequoias viewed by white man, in 1833, were probably in this grove or the nearby Merced Grove. Located near Crane Flat on the Big Oak Flat Road. 5. Merced Grove: Contains 20 large trees. Located 4 miles south of Tuolumne Grove. 6. Mariposa Grove: One of the most famous groves; contains more than 200 trees 10 feet or more in diameter and thousands of younger trees. Includes the Grizzly Giant, also the Wawona Tree through which a tunnel was cut in 1881 for the passage of horse-drawn stage coaches. Located in the southwest corner of the park, 35 miles by highway from Yosemite Valley. 7. Fresno (Nelder) Grove: Now covers about 200 acres. Partly cut in the 1880's and later burned, but still contains many large trees and good reproduction. About 5 miles south of the Mariposa Grove. 8. McKinley (Dinkey Creek) Grove: A fine grove covering about 50 acres and containing 170 large trees but little reproduction. On Dinkey Creek, a tributary of the North Fork of Kings River, 38 miles southeast of the Fresno Grove. 9. Boole Tree Grove: 10. Converse Basin Forest: 11. Indian Basin: Remnants of a once fine forest (probably the most extensive) which covered about 6,000 acres but was almost completely cut over between 1862 and 1900 and later burned. The Boole Tree, one of the largest trees in the world, was left standing on the slopes of Converse Mountain. Some reproduction in spots. Located on Converse, Mill, and Indian Creeks, south tributaries of the Kings River. 12 to 16. Kings River Groves: A group of relatively small groves, mostly inaccessible, located south of the South Fork of the Kings River. Partly in private ownership and accessible only by trail. 18. Big Stump Grove: This entire grove was cut over but now has very dense reproduction in spots. Contains the Adam Stump, a remnant of one of the largest trees ever cut. Partly included in Kings Canyon National Park which was established by act of Congress of March 4, 1940. 19. Redwood Canyon (Redwood Mountain) Forest: Perhaps the best example of an all aged stand of giant sequoias. Covers more than 2,500 acres and contains thousands of these trees. Purchased in 1940 by the Federal Government from private owners for inclusion in Kings Canyon National Park. On Redwood Creek, a tributary of the North Fork of the Kaweah River. Accessible from the Generals Highway. 20. Lost Grove: A small but beautiful grove through which the Generals Highway passes. Covers 57 acres and contains 15 trees more than 10 feet in diameter. Near the northwest boundary of the park. 21. Muir Grove: One of the most beautiful groves. Covers 450 acres and contains many very large trees. Two separate grovesPine Ridge and Skagwayare included with this area. In the northwest section of the park on tributaries of the North Fork of the Kaweah River. 22. 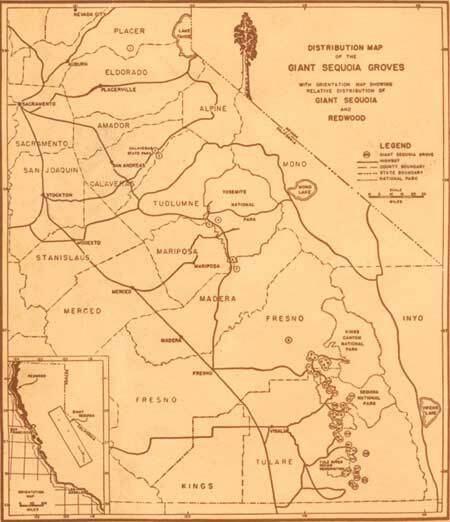 Halstead (Suwanee) Grove: A small but attractive grove covering 70 acres west of the Marble Fork of the Kaweah River. 23. Giant Forest: The largest and finest forest of giant sequoias in the world, with many portions where other species of trees are practically excluded by the density of the large sequoias. Contains three of the largest known treesGeneral Sherman, Lincoln, and Presidentas well as hundreds of other giants. The forest covers 2,387 acres. Located between the Marble and Middle Forks of the Kaweah River, at 5,000 to 7,000 feet elevation, on the Generals Highway. 24. Redwood Meadow Groves: Five separate groves covering 400 acres. Several unusual features are found in these groves. There are 5 large, fire-killed standing sequoias (rare in the groves). The only known young sequoias growing upstream very far from the old groves are found here, with 2 trees, 2 and 3 feet in diameter, growing more than half a mile from any others. They are apparently not relics of a former stand in this vicinity. On the headwaters of the Middle Fork of the Kaweah River. Accessible only by trail. 25. Castle Creek Groves: Three hundred forty-five acres of widely scattered sequoias on the south slopes of the Middle Fork of the Kaweah River. Accessible only by trail. 26. Atwell Grove: A fine forest with many large trees and abundant reproduction. Covers 1,440 acres, including the more or less separate Redwood Creek Grove. Partially logged years ago. The highest elevation at which a giant sequoia is known to grow naturally (8,800 feet) is found here. This tree is 13.7 feet in base diameter and 140 feet tall. On the East Fork of the Kaweah River. Accessible from the Mineral King Road. 27. East Fork Grove: Covers 473 acres in the park and 321 acres in the Sequoia National Forest. A fire, years ago, divided this grove into two separate units. On the south side of the East Fork of the Kaweah River. Accessible by trail. 28. Paradise Ridge, Oriole, and Squirrel Creek Groves: Cover 230 acres of beautiful forest including several large specimens. Near the west boundary of the park, on the north side of the East Fork of the Kaweah River. 29. Coffeepot Canyon and Case Mountain Groves: Outside and west of the park. Cover about 200 acres. Few large trees. 30. Eden Grove: Covers 864 acres, with many large trees rather widely scattered. On the south side of the East Fork of the Kaweah River. 31. Horse Creek Grove: This grove was first reported in 1933. Covers 90 acres and contains approximately 70 trees more than 10 feet in diameter. On a tributary of the East Fork of the Kaweah River. Inaccessible. 32. Surprise Grove: 33. South Fork Groves: Three groves covering 665 acres, with many large trees. On the north side of the South Fork of the Kaweah River. Accessible only by trail. 34. Garfield Grove: A fine grove covering 1,356 acres, with many large specimens. The lowest elevation at which the giant sequoia is known to grow naturally (2,900 feet) is located beside the river below this grove. South of and on tributaries of the South Fork of the Kaweah River. Accessible only by trail. 35. Dillonwood Grove: A large grove containing many large and fine trees. Lower portion partly logged. Covers about 2,000 acres on the headwaters of the North Fork of the Tule River, partly within the park and partly within the Sequoia National Forest at 5,400 to 8,000 feet elevation. 36. Devils Canyon and Dennison Mountain Groves: Two small groves covering about 56 acres in the southwestern corner of the park. Inaccessible. 37. Rancheria Grove: A small grove on Bear Creek, a tributary of the North Fork of the Tule River. 38. Mountain Home Forest: A fine grove containing several hundred specimens and many interesting trees. One, the Hercules Tree, still lives despite the cutting of a large room in its heart many years ago. Another, the Sawed Off Tree, was cut completely through more than 50 years ago but is still standing. The area includes Balch Park, a 160-acre Tulare County Park. On the North Fork of the Middle Fork, Tule River. Accessible by road. 39. Crystal Springs Grove: A beautiful grove on Bear Creek below Mountain Home. Contains many interesting trees, including the Wishbone Tree, through which passes the old Mountain Home Road. 40. Maggie Mountain Grove: A small and rather inaccessible grove above Mountain Home on the North Fork of the Middle Fork of Tule River. 41. Hossack Grove: About 200 widely scattered trees on the divide between the north and south branches of the Middle Fork of Tule River. Inaccessible. 42. Belknap Grove: 43. McIntyre Grove: 44. Wheel Meadow Grove: A group of relatively small groves along the East Fork of the Tule River near Camp Nelson. Some groves accessible by road. 45. Black Mountain Grove: A large grove containing more than 500 large trees, on the slopes of Black Mountain between the Middle and South Forks of Tule River. Partly in the Tule River Indian Reservation. 46. Lloyd Meadow Grove: More than 100 large trees scattered for a distance of approximately 3 miles along Freeman Creek, a tributary of Kern River. 47. Red Hill Grove: A small inaccessible grove at the head of the South Fork of Tule River. 48. Long Meadow Grove: A small grove, accessible only by trail. On a tributary of the Kern River. 49. Powderhorn Grove: 52. Starvation Creek Grove: Small groves. The former is accessible by road, but the latter is rather inaccessible. On the headwaters of Deer Creek. 50. Rogers Camp (Peyrone) Grove: 51. Parker Peak Grove: Medium-sized groves, containing more than 100 scattered specimens in inaccessible country on the South Fork of Tule River. 53. Pack Saddle Grove: A grove of about 300 large but scattered trees, including one more than 22 feet in diameter and 280 feet tall. On South Creek, a tributary of the Kern River. Accessible by trail. 54. Deer Creek Grove: The most southerly grove of giant sequoias. Contains 31 large trees and some reproduction. Located about 6 miles north of the southern boundary of Tulare County on Deer Creek above Hot Springs. Accessible by road.